In a milestone achievement for better understanding the development and function of the human placenta, scientists have derived and grown trophoblast stem cells for the first time. The project was led by Takahiro Arima, a professor of informative genetics at the Tohoku University School of Medicine in Japan. The research team published their results in Cell Stem Cell, a journal published by the International Society for Stem Cell Research. The team also includes scientists from Kyushu University. "Trophoblast cells play an essential role in the interactions between the fetus and mother," wrote Arima. These cells form the outer layer of the blastocyst, which eventually develops into an embryo and into a fetus. Trophoblast cells become the placenta, providing nutrients to the fetus and taking away waste. Too few or too many trophoblast cells can mean disaster for the fetus and mother. An imbalance of trophoblast cells can lead to miscarriage in early pregnancy, or preeclampsia and other conditions later on. That is why it is important to study human trophoblast development and function, wrote Arima. 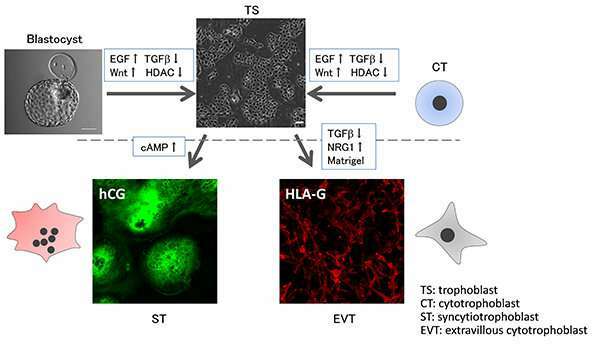 "In our paper, our goal was to establish human trophoblast stem cells [as a tool for future study]." The researchers derived trophoblast stem cells from human volunteers with approval from the Ethics Committee of Tohoku University School of Medicine. The cells were then transferred to a growth medium to proliferate, but the cells died off. Using genetic sequencing, Arima and his team found that the cells needed certain proteins activated and others inhibited to stay alive and maintain the same characteristics they would have in utero. Other cultured cell lines have been used as models of human trophoblast cells, according to Arima, yet those cells have drastically different protein expression than native trophoblast cells. Such differences could make it more difficult to determine disease origin or potential therapeutic targets. "Our culture system for human trophoblast stem cells is potentially useful for understanding the pathogenesis of developmental disorders with trophoblast defects, such as miscarriage, preeclampsia and intrauterine growth restriction," Arima wrote, adding that the research team hopes the tool will be used for medical science, especially in the fields of etiology and new drug development to treat perinatal disease.